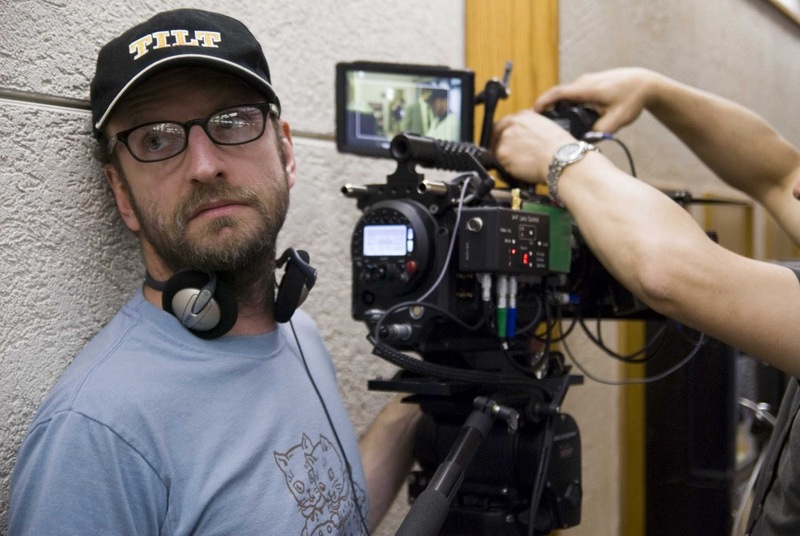 Steven Soderbergh is 55 today. That puts a solid decade between us. Not that it matters. With ten years less on his life he’d still have done ten times more than me. The man is prolific to say the least. Since “retiring” from theatrical film, he’s made two television series (Mosaic debuts on HBO this month) and...well, one feature film, the 1970s-style character piece Logan Lucky, a singular and pleasing gem of 2017. 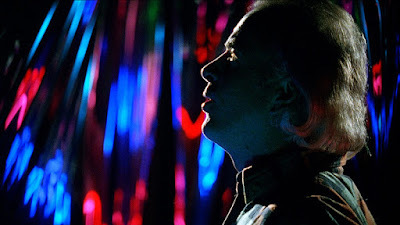 He’s one of my favorite contemporary filmmakers, reminding me of classic studio men who could adapt to any style, tackle any genre, and still maintain his unique vision. 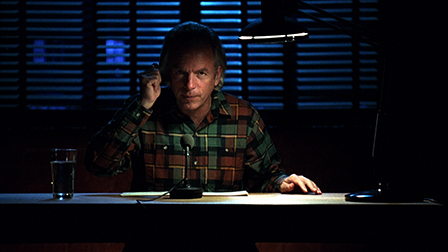 To celebrate this day, I decided to review the last Soderbergh movie in the Criterion Collection needing coverage on this blog, the Spalding Gray documentary Gray’s Anatomy, released in 1996 and seen by Soderbergh, alongside Schizopolis [review], as part of a creative reset. 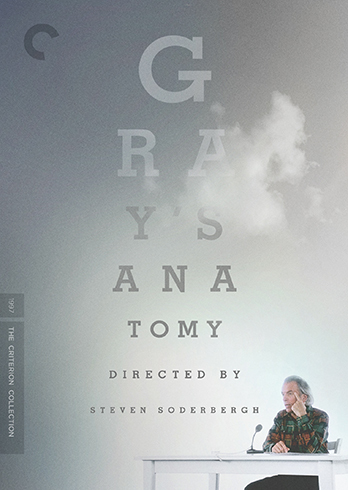 Years later, the auteur would also make And Everything is Going Fine [review], a more traditional documentary about Gray, but Gray’s Anatomy is a performance piece, not a reporting. 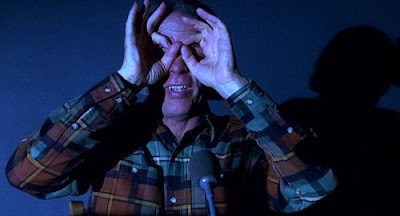 It’s Steven Soderbergh capturing one of the monologists most famous shows, a lengthy one-man narrative describing an extended medical condition and his coming to grips with treatment. Soderbergh doesn’t dress up the performance too much. Breaking the mo nologue down to anecdotes, a sort of equivalent of scenes, he shot Gray acting out the material for the camera, no audience, using different backdrops and occasional camera tricks to add a little visual flair to the staging. To round out the piece, he also interviewed regular people about their eye injuries and quizzed them on whether or not they would try the same things as Gray. These interviews break up the monologue here and there, but are never intrusive. In fact, none of Soderbergh’s set-ups are too showy or complicated; he knows better than to draw attention from the man himself. 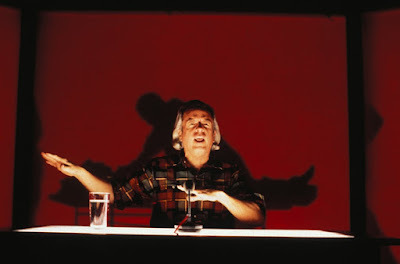 Gray’s Anatomy succeeds or fails on Spalding Gray’s charisma and rapport with the viewer. The version Gray presents of himself is interesting. While the central theme of Gray’s Anatomy is fear--fear of not just the potential disaster of medical error, but fear of making a decision. Yet, for all his trepidations, the Gray at the center of these stories is also a man open to experience, who is willing to try things less for the hope of their curing his vision, but because he’s never done them before. Hence the seemingly unconnected anecdote of the time he cleaned the yard behind a synagogue. He’s telling us that he is a man that will do things despite not knowing the outcome. For all his anxiety, he is actually quite daring. I mean, consider that public speaking is one of the most common fears of average people, and yet this guy gets up before an audience and shares his life as a career. You can’t dispute his courage. One thing that surprised me about Gray’s Anatomy is that it doesn’t finish with any great revelation or profound statement about life. Gray doesn’t appear to think he has any big answers to share; rather, it’s the simplicity of his efforts that make them relatable, and the journey he describes is no less fascinating for not concluding with an epiphany. Quite the opposite, Gray’s Anatomy would have probably fallen flat had Spalding Gray (along with co-writer Renée Shafransky) decided he was illuminating us to some new wisdom. It’s too intimate for that, the confidence he is placing in us is not just trusting us to know his secrets, but to know what to do with them, as well. And Soderbergh, whose eye for detail is equal to Gray’s, knows yet again not to get in the way, and instead just plays it as it lays.